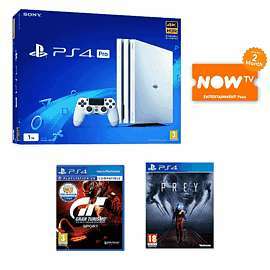 Good deal for PS4 pro white with two quality games. I think we need to be seeing a much better price or better games now in my opinion. Its not a bad price given what has been around post Black Friday, but the retailers are testing the water here. I've heard it on good authority that they have alot of stock of PS4 slims and pros, and want to shift as much of it as possible in the run up to Xmas. Expect better deals from around the 11th December. Two top games, plus a Now TV pass for c. £260. Hold your nerve and don't jump too early! Its not a bad price given what has been around post Black Friday, but the …Its not a bad price given what has been around post Black Friday, but the retailers are testing the water here. I've heard it on good authority that they have alot of stock of PS4 slims and pros, and want to shift as much of it as possible in the run up to Xmas. Expect better deals from around the 11th December. Two top games, plus a Now TV pass for c. £260.Hold your nerve and don't jump too early! I don’t think price are going down anytime soon now. Yes it could be better bundle deals like good 2-3 games or extra controller but it will be around same price mark as Black Friday week. Hmm not bad, but not yet for me, I’m holding out till the 11th! Do you work at game? I do hope you are right! I have nothing to lose waiting until then. Thank you in anticipation. I have a PS4 Pro reserved at Grainger Games for £299 with two games (they agreed to honour a deal) but I think I will wait! I like how you've liked your own post! Ill take your word from it mate! There's nowt wrong with liking your own post when you're talking sense!! What's the matter fella? You can't wait a few more days? Well it's the 11th...no deals..
mate its the 11th of Dec so where is this deal you speak of? "Around" the 11th. There's will be one or two towards the end of the week. The best deals will be Boxing Day. "Around" the 11th. There's will be one or two towards the end of the week. …"Around" the 11th. There's will be one or two towards the end of the week. The best deals will be Boxing Day. I hope you miss one with an attitude like that. Dear oh dear me, it is hardly my fault if circumstances are such that situations change. If you want to buy a PS4 pro at 299, go ahead if you think it's worth it to you. For me, it is overpriced and I'll be holding my horses for a while longer, but you don't need my permission. Your attitude is highly regrettable young man. Though don’t judge my attitude, there’s no attitude; I’ve merely commented on your incorrect predictions. Lastly I’m not young and I’m not a man, perhaps time for you to adjust your attitude and presumptions.....Henry James is simply an author I admire. If you think it’s overpriced fair enough,Though don’t judge my attitude, th …If you think it’s overpriced fair enough,Though don’t judge my attitude, there’s no attitude; I’ve merely commented on your incorrect predictions.Lastly I’m not young and I’m not a man, perhaps time for you to adjust your attitude and presumptions.....Henry James is simply an author I admire. I fail to see the relevance of Henry James as an author to your point here. Either way I thumb my nose at you and wish a pox on your chances of a good PS4 pro deal. Good day and good riddance to you old woman.